Tuesday is Election Day in Virginia and in some Maryland cities. Here's what voters need to know before they head to the polls. WASHINGTON — Virginia voters heading to the polls on Tuesday will weigh in on the tight race for governor, but they’ll also find plenty of choices to make farther down the ballot, including local races and contests for the state General Assembly. Virginia voters will choose a new lieutenant governor and decide whether to give the attorney general another four years in office in addition to selecting a new governor. And, in much of the state, voters will decide contested races for House of Delegates seats. In Maryland, voters in some cities will decide local races for mayor and council. D.C. residents aren’t scheduled to hold an election until next year. Here’s a recap of the races on the general election ballot, plus resources for voters. WTOP will have live coverage of the results Tuesday night. Polls: The polls are open from 6 a.m. to 7 p.m. on Tuesday in Virginia. Registration: It’s too late to register to vote and take part in Tuesday’s general election. Polling place: Look up your polling place here. What’s on the ballot? Find sample ballots for your precinct on the Virginia elections website. Many local boards of elections also post sample ballots on their websites. Photo ID? Virginia requires voters to provide photo identification to cast a ballot. Voters without an ID can obtain one from their voter registration office. On Election Day, voters who forget their ID can cast a provisional ballot, but must provide an acceptable form of ID to local election officials before the ballot would be counted. Learn more at the Virginia elections website. Where to find results: WTOP will have live results as they come in Tuesday night. Tune in on air and online. Virginia’s race for governor is receiving national attention as it is considered an important gauge of voter sentiment one year into Donald Trump’s presidency and a harbinger of next year’s midterm congressional elections. The question both political parties want to know: Will supporters turn out for an establishment candidate, former Republican National Committee Chair Ed Gillespie, and will Democrats — angry over Trump’s policies — turn out in an off-year election to support Ralph Northam, a pediatric neurologist from the Eastern Shore. The candidates have run more traditional campaigns, but the number of attack ads has mounted in recent weeks as the polls continue to suggest the two are running neck and neck. 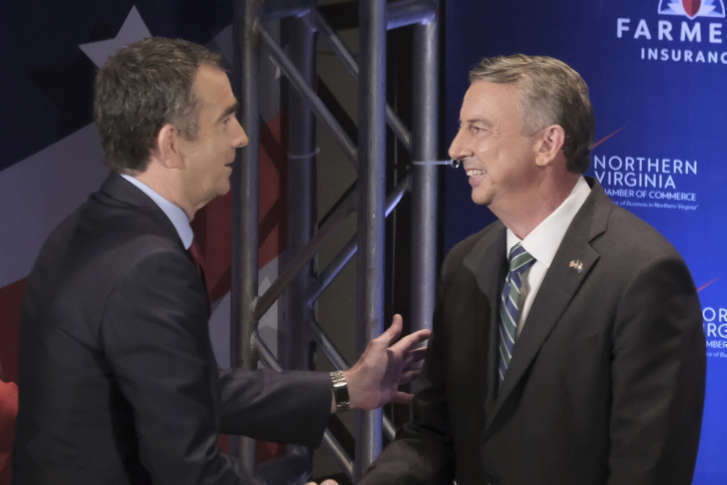 Gillespie and Northam differ the most in their approach to the economy and immigration, but agree on some issues, such as the need to improve workforce training and boost teacher pay. Libertarian Cliff Hyra is also running for governor. Read more about all three candidates and their positions on WTOP. Voters will also decide whether to re-elect Attorney General Mark Herring or give political newcomer John Adams a chance. And they will decide who will preside over the Virginia Senate, possibly breaking tie votes, as lieutenant governor. State Sen. Jill Vogel, a Republican, faces Democrat Justin Fairfax, a former federal prosecutor. Read more about the candidates for attorney general on WTOP. Meet the candidates for lieutenant governor on WTOP. All 100 House of Delegate seats are also on the ballot — but 67 districts have contested races this year. And Democrats are challenging Republican incumbents in 48 districts, hoping to increase their numbers in the GOP-controlled House. Two years ago, just 29 districts fielded candidates from both major political parties. Read more about the competitive races in Northern Virginia on WTOP. Voters in some Virginia cities and counties will decide local races, too. In Arlington County, voters will choose one at-large county board member and one school board member. Falls Church voters will choose four members of the city council and four school board members. In Leesburg, Joshua Thiel and Vanessa Richardson Maddox are running to fill out the remainder of an at-large town council seat. And Stafford County voters have several contested races for board of supervisors and school board. Voters in some Maryland cities also have a reason to head to the polls on Tuesday: to choose their mayor and city council members or decide ballot issues, such as charter amendments. Here’s a quick look at some of the elections in Montgomery, Anne Arundel and Prince George’s counties. Annapolis voters will decide whether to re-elect Mayor Mike Pantelides, a Republican. He faces challenger Gavin Buckley, a Democrat. All eight seats on the council are up for election. Only Wards 3, 4 and 6 are uncontested races. Find more information about the race, including sample ballots and polling locations, at annapolis.gov. In College Park, three candidates are challenging Mayor Patrick Wojahn for the post. Voters in all four city districts have competitive races for city council. Voters will pick two council members per district. Find more information about the candidates and city polling locations at collegeparkmd.gov. Frederick Mayor Randy McClement is running for re-election and faces Democrat Michael O’Connor. Ten candidates are running for alderman. Voters will pick five. Learn more about the election and candidates at cityoffrederick.com. Gaithersburg voters will choose two city council members. Four candidates are vying for the office. Mayor Jud Ashman is running for re-election unopposed. Find more information about Gaithersburg city’s election and the candidates at gaithersburgmd.gov. Greenbelt voters will choose seven at-large members of the city council and will decide two ballot issues. One would lower the voting age for city elections to 16 and the other is a bond referendum to repair a dam. See a sample ballot and find other election information at greenbeltmd.gov. Voters in Laurel will select five members of its city council — an at-large, plus four ward seats. Find polling locations and sample ballots at cityoflaurel.org. Takoma Park’s Mayor Kate Stewart is running unopposed. Voters in Wards 2, 5 and 6 have competitive races. Polling will be held at the Takoma Park Community Center. Learn more about the candidates at takomaparkmd.gov.